Favres, Hurleys and Mauks among prominent family lineage at prep level. 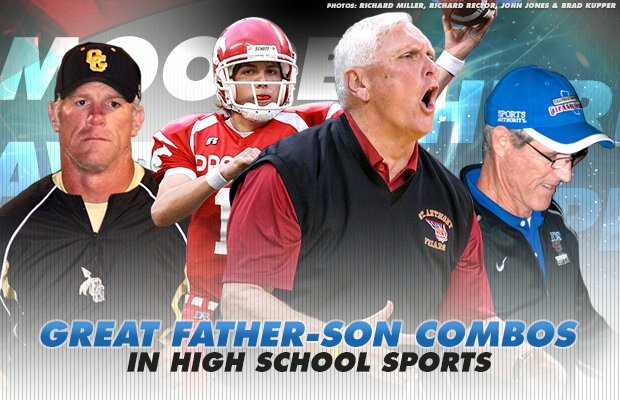 Fathers coaching their owns sons is not an uncommon occurrence at the high school level. It's a touchy subject for some with fears of nepotism coming into play and the term "Daddy Ball" being used in hushed tones. But father-son combinations have also teamed up for some incredible accomplishments and legacies at the high school level. From the Hurleys in New Jersey to the Tirapelles in California, here's a look at 10 of the greatest in prep sports history. Long before the passing game took hold at all levels of football, there was Vic Cuccia and his son, Ron. A coach who was a head of his time, Vic led Wilson (Los Angeles) to a 151-42-6 record in 22 years, including a 39-game win streak and three straight Los Angeles City Section 3A championships from 1975-77. The quarterback on those teams was Ron Cuccia, who earned section Player of the Year three seasons in a row and finished his career with a national record of 8,804 yards passing. Nobody has won more football games in the state of Texas than Calallen (Corpus Christi) coach Phil Danaher, who became the all-time leader in 2016 when he surpassed G.A. Moore with 427 wins. He has 458 wins and 110 losses in a 45-year coaching career. One of his best players was his own son, Wes, who played four seasons on the varsity (1992-95) and finished his career with 8,855 yards rushing. When he graduated, Wes ranked second in the state in career rushing yardage only to all-time great Ken Hall, who had 11,232 yards. Wes still ranks No. 6 in state history in career rushing yards. When Brett Favre finished his NFL career, no player in league history had thrown for more yards. Yet, when he was in high school at Hancock North Central (Kiln, Miss. ), he rarely threw the ball. That's because his father, Irvin, who was the head coach, reportedly felt the team should run the ball in the Wishbone due to the number of quality running backs on the team. Irvin, who coached for 24 years in the Hancock County School System, led St. John to a state championship in 1970 and was a consistent contender at Hancock. Chad Grier had a short and sweet coaching career at Davidson Day (Davidson, N.C.), a program he built from the ground up and led to four North Carolina Independent Schools Athletic Association state championships in four seasons. He went 65-9 during that stretch and has since moved on to coach two seasons at Oceanside Collegiate Academy (Mt. Pleasant, S.C.). During his tenure at Davidson Day, Chad had one of the best quarterbacks in the nation, his son, Will. The Parade Magazine national Player of the Year in 2013, Will finished his career with 14,565 yards passing and 195 touchdowns. His yardage total ranks No. 9 all-time nationally and the touchdown total ranks No. 4. He was a Heisman Trophy candidate last fall at West Virginia and is expected to be taken high in the 2019 NFL Draft. Few high school basketball coaches have been more celebrated than Bob Hurley Sr. In 39 years as a coach at St. Anthony in Jersey City (N.J.), Hurley won 26 state championships, four national titles and 1,185 games. Both Danny and Bobby played for him with great success. Bobby went on to an All-American career at Duke, leading the Blue Devils to two NCAA championships. A car accident cut short his NBA career, but he has joined his father in the coaching ranks and has been Arizona State's head coach since 2015. Danny often challenged his father for national supremacy while coaching at St. Benedict's Prep (Newark, N.J.) during the early 2000s. He has since coached at the NCAA level and is currently at Connecticut. No coach in high school football history has coached more prolific passers than Glendale (Springfield, Mo.) coach Mike Mauk, and two of his most prolific quarterbacks have been his sons, Ben and Maty. While at Kenton (Ohio), Ben broke the national passing yardage record in 2002 when he finished his career with 17,364 yards. Nine years later, younger brother Maty broke Ben's record with 18,932 career yards. The brothers rank Nos. 1 and 2 on the national all-time career passing yardage list. Mike Mauk recently overcame a battle with cancer and has won 246 games in his coaching career in Ohio and Missouri. Tim McDonald grew up in Fresno and was a star defensive player at Edison (Fresno, Calif.) before moving on to USC and eventually the NFL. He played 13 seasons in the NFL and was a six-time Pro Bowl selection. Following his retirement, McDonald returned to Edison and became head coach. There, he coached sons, Tim Jr. and Tevin. Tim Jr. was a high school All-American, like his father, went to USC and was an All-American, like his father, and is in his sixth season in the NFL. Tevin is currently playing in the Canadian Football League. There are few coaches with more success in Washington state than Tom Moore. The same is true for his sons, Kellen and Kirby. Tom began coaching at Prosser in 1986 and won 21 league championships and four state crowns over the next 23 seasons. Two of the biggest stars at Prosser during that time were his sons: Kellen, the quarterback, and Kirby, the wide receiver. Kellen set numerous state records, including passing yards in a season (4,600) and touchdown passes (67) while winning the Gatorade State Player of the Year award for the 2006 season. He finished his career with 11,367 yards. Kirby had 131 catches, for 2,126 yards and 34 touchdowns his senior year while earning Class 2A state Player of the Year honors. He holds the national record for career touchdown receptions with 95. For the better part of 50 years, the only name in high school football in Mayfield (Ky.) is Morris. Jack Morris took over as head coach at Mayfield in 1969 and posted a 254-50-2 record in 24 years. His team won four state titles, including back-to-back seasons in 1977 and 1978 and 1985 and 1986. Jack retired in 1992 and son, Joe, who played for his father and was also an assistant coach, eventually took over in 1999. He's posted a record of 239-49 in 20 seasons. Joe has not won fewer than 13 games in each of the past 10 seasons and has a record of 139-11 with six state championships, including four in a row from 2012-15. Mayfield ranks No. 3 in state history and No. 4 in national history for most all-time wins with 887. No school has dominated high school wrestling in California like the Clovis Cougars. In a state that has only one state classification for the state championship, Clovis has won 13 state titles, more than double the next school. Tirapelle is in his 35th year of coaching and his 20th at Clovis. The Cougars have won seven state titles under Tirapelle, including five in a row between 2011-15. His team has placed in the top five in 18 of his 20 seasons . His sons Adam, Alex and Troy combined for eight state championships with Alex and Troy each winning three apiece. All three wrestled at the University of Illinois. Adam assists his father at Clovis. Alex is an assistant at Stanford. Troy is the head coach at Buchanan, which won the 2019 California state meet. Bob Hurley’s run at St. Anthony coming to an end?